Jrue Holiday had eight assists for New Orleans, half of the total assists generated by the entire Clippers team. The Pelicans also overcame 23 turnovers. Cousins lost the ball eight times – two on offensive fouls – and Holiday had seven turnovers. ”We tried to keep DeAndre off the board and keep Blake Griffin off the paint,” Davis. ”We the amigos,” cracked Cousins after the game. Point guard Rajon Rondo, the Pelicans’ major offseason free-agent acquisition, is a week to 10 days from making his regular season debut. Clippers: Griffin had his 2,000th career assist with a pass to Sindarious Thrornwell early in the first quarter. … Guard Patrick Beverley missed his second game in a row due to a sore right knee. … Rivers and assistant coach Sam Cassell were hit with technical fouls in the fourth. Pelicans: Guard/forward Tony Allen did not play, leaving the Pelicans without the services of six players. Gentry said Allen was pulled for rest. … Though he leads the league in charges taken with five, Cousins had two offensive fouls in the first quarter. 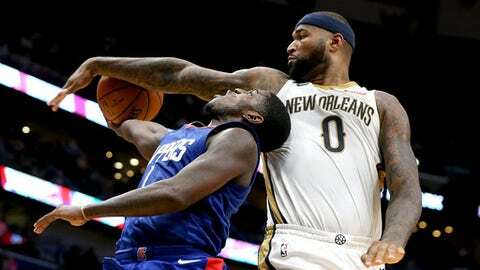 … Forward Cheick Diallo, who has shuffled between the Pelicans and the G-League since being drafted last season, looked sharp off the bench with nine points and six rebounds.